We started raising registered Texas Longhorns in 1992 with a goal in mind -big horned, competitive show cattle. Since that time, our focus shifted more to broadening the marketability of our herd. We did this with the addition of LP Sombrah. The quality of LP Sombrah is evident in the type of offspring he produces. When we began building a program, we purchased a great Phenomenon son, named JMC Phenomenal Archie. We blended those genetics with the powerful and well known Turbo Jet, a wonderful Jet Jockey son, who produced LP Sombrah’s dam, LP Turbo’s Lena. When the drought hit Texas, we realized that we could no longer keep so many of his daughters and have room for him, too. So, a very good friend, Bob Garner, Goldwaithe, Texas made a nice offer for his purchase and off he went. In came LP Sombrah. He measured 62” tip to tip on his second birthday. He grew to 72” prior to tipping both horns 2-3 inches on each side. We still have those tips in a desk drawer today. We cross a lot of his daughters with Ja'Malice, who is out of the late Jamakizm. We decided at that point to purchase Black Kettle, a Sittin' Bull son to pull in a different genetic cross. We were blessed with luck, and our breeding program started producing top quality animals for the show ring and with horns, competing in several Horn Showcases. Turbo Jet was named by a 2000 survey as the number one bull for breeding show prospects and one of the top 20 bulls living today. He was represented by 25 entries in the 2000 World Show with 6 class winners. He is still represented today very well with offspring competing in shows across the country. 2005-Present - Millennium Futurity Winners with "Butkus" (2 years running), "Turbo's Pitch"," Fire Angel", and "Slammin' Shadow"
As our showing slowed down, we began to participate more in the day to day activity of re-evaluating the herd, replacing older cows with different genetic opportunities. We began participating more in sales opportunities, the Millennium Futurity, the Legacy, etc. With LP Sombrah the awards continued. All of his accomplishments are listed on his page. 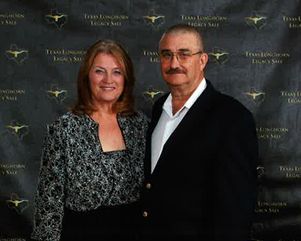 Christy served on the TLBAA Board for several years before stepping down in 2008. We are members of the TLBAA, the ITLA, and the Texas Longhorn Marketing Alliance. We are Partners of the Millennium Futurity. We are located 35 miles southeast of Austin on Highway 71 in the Lost Pines of Texas, 3 miles west of Smithville. Take a tour of our site for a show prospect, special cow, calf or new herd sire. Since we are partners for the Millennium Futurity, all animals purchased from us are eligible to participate. Call or come by for a personal tour anytime. Our mobile number is 713- 703-8458 and we’ll be glad to answer any questions. Our e-mail address is lpinesranch@aol.com.